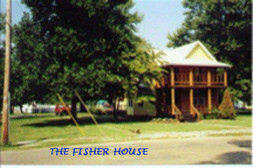 Dad bought the Fisher House in 1953. We moved from the other end of town where we had a two-holer and no telephone. Glen and Lily Fay Fisher had retired and moved to Texas. We couldn't believe our good fortune to get a chance to actually purchase this elegant old home. Glen left a lot of his tools and souvenirs from past vacations out in the wooden sheds that lined the rear of the backyard. I found a huge Bowie Knife with a silver handle and Mexican etching all along the blade. There were knapsacks, fishing gear, all sorts of good stuff. I was in kid heaven. The first thing dad did was rent the upstairs to a newly wed couple, Peg and Wilbur Hargrove. They had to come through our living room to get to the upstairs, but we didn't mind. Dad's house payment was $45 a month and he rented the upstairs to Peg and Wilbur for $35, so for $10 dollars, sure, come on in. My parents were all in a tizzy getting ready for when my brother John was about to be borned. John was the first in our family who had to go to the hospital to get borned. Yes, we were really coming up in the world. So between a nursery for John, my sister, Pearl, and all other things considered, there wasn't a bedroom for me on the ground floor. They had a cot set up in the dining room for me. Right on the way through to the kitchen or the bathroom. This was not satisfactory for a growing boy. So I moved upstairs with Peg and Wilbur. They didn't seem to mind. To tell the truth, I don't think they even noticed. If you know what I mean. Along with the house, we also got a couple of acres of land at the rear of the main yard. It ran almost all the way down to the railroad tracks. There was a dirt path through the middle where mill workers were used to taking a short-cut to get to work. The first year we lived there, dad put the back lots into a garden. A gigantic garden. Now remember that this was a long time ago, and dad didn't have a power tiller or anything else. The only power he had came from him. But he worked every evening and on weekends putting in that garden. Corn, Potatoes, Tomatoes, Beans, Cucumbers, Squash, Okra, lots and lots of veggies. When the garden started to come in, it was too much for us to eat at once. I would fill my little red wagon and go door-to-door peddling my corn, tomatoes, and beans. Dad made a point to mention that all during that summer and autumn, mother never once failed to accept his weekly food budget money. That garden never saved him a single cent. That was the only year he put in a garden. He often mentioned that fact for many years to come. When I moved upstairs with Peg and Wilbur, I took the room at the far end of the second floor. My window opened to the roof of the wrap-around back porch. I soon learned how to get out my window, jump from the porch roof to a tree in the back yard and shinny down to the ground. I had my very own private way to get out of the house. I never got the hang of going up the tree and leaping to the roof, so I had to go in through my parents living room, just like Peg and Wilbur. But, like I said, we didn't mind. It was a cold day in December when I was walking to school. Jimmy Green ran up to me and said that his mother heard on the radio that I had a baby brother. I suppose if you are going to get a baby brother, that's as good a way to hear about it as any other. And thus began, the Era of John. And that's another story for another time.